If you were a Streamyx user converted to Unifi, likely you have realized that you had enough LAN ports in Streamyx time but not with Unifi, well, if you fully utilized the 4 LAN ports on the Streamyx's ADSL router. This is because one LAN port marked in red color on the Unifi's wifi router is reserved for IPTV. That's what exactly hitting me when I upgraded from Streamyx to Unifi. Of course there is a virtually "zero-cost" solution by recycling the ADSL router you have. What you need to buy (if you don't have) is a short crossover cable, power up the ADSL router, turn off or disable the wifi on ADSL router, connect one end of the crossover cable to LAN port on Unifi wifi router, connect the other end to the LAN port on the ADSL router and you're done with 5 available LAN ports to be used! Please note that it's LAN port on both the ADSL and Unifi wifi router NOT the WAN port. Some modern routers come with Auto MDIX feature that you don't even need to buy a crossover cable, a usual straight cable will do. Well, alternative above is not ideal for me 'cause I need more than 5 connections. Further to that, I stream full HD Bluray contents from my NAS to the media player (and might be multiple media players streaming simultaneously in near future), while some big files copy and downloads might be happening concurrently, therefore gigabit backbone is a must. To go a little more advance, I plan to segregate the local network into different segments, namely the vlan - one for PC network, one for media streaming and the other for IP CCTV network. And for IP CCTV, PoE feature is required to power up my IP cameras. 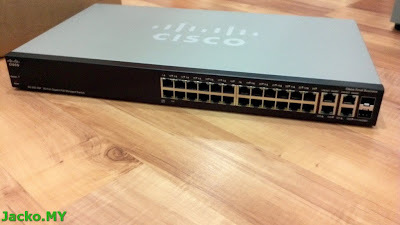 It's Cisco's 300 series managed Layer 3 switch (in layman term, switch is a Layer 2 device that only performs network switching but Layer 3 switch is capable of performing network routing. Refer to OSI model 7 layers). It comes with 28 gigabit ports and 2 mini GBIC combo ports (shared with port-27 and port-28) which I don't think I would be using it. Its switching capacity is 56Gbps which is definitely more than what I need for my requirements. The prefix P in the model number denotes the PoE feature that I need for the IP cameras delivering maximum power of 15.4W per port of total 180W dedicated to PoE (means 11 ports can be used to supply power to PoE devices that draws max 15.4W each). Other than that, vlan support is a piece of cake for this managed switch and it also supports jumbo frames. Not to forget it's future-proof with native support for IPv6. 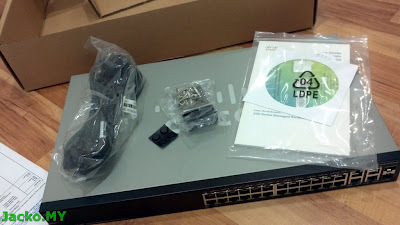 As you can see from the photo above, the package comes with the switch, a power cord, rack mount kit, a quick user guide and a documentation CD. There is also a serial console cable (not in the photo) to access the switch using its console port. From left, the console port, 2 fans and the input power. As this switch is not a consumer-grade switch, you see 2 fans and data sheet lists the noise level as 40dB. So you may want to reconsider if you plan to have the switch sitting next to you. This is the trade off (for a business-grade switch) you need to compromise. 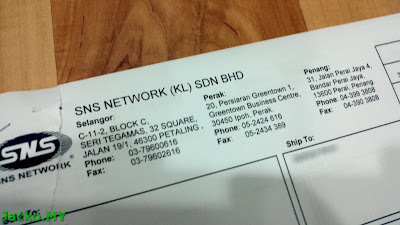 You can't get this switch easily from any IT shop or Low Yat. 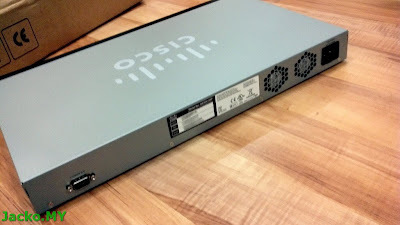 You will have to buy from one of the Cisco resellers. Head on to MySMEConnect.com for a list of resellers. Apparently this site was created by Cisco and was discontinued after a short period of time due to lack of response. 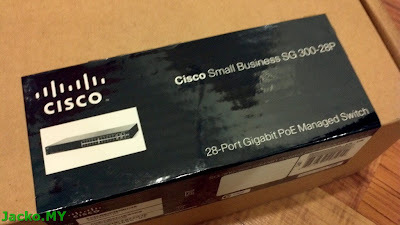 My feedback to Cisco is do more marketing, SMB is a very huge pie to grab in Malaysia. There are also many SOHO whom might be looking some higher grade products (than consumer grade) for their home offices just like me. 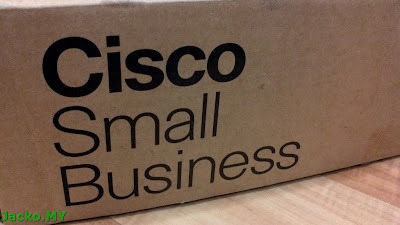 I reckon the site should continue as a platform for Cisco to penetrate into the market that they have never been to, at the same time to be more aggressive in marketing their Small Business products. Stop for now. I hope I have time later to continue a little more in depth with this switch.